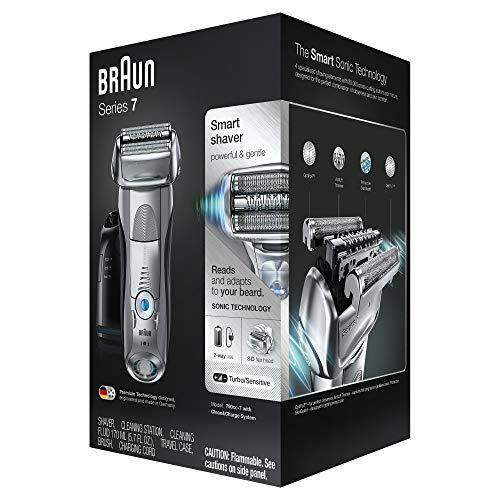 For men looking for electric shaver with superior performance, comfort and convenience, Braun Series 7 shavers are considered excellent choices. Braun has released five models in this series: 720, 740, 760, 790, and 799 models. Although they have some unique features that make each of them stand on its own, they share some features that make all of them great choices for men looking for high-quality shavers. Four of the best models in the series will be released here. If you are looking for the best shaver that guarantees super close shave, you may need to look into those four models. Braun has recently released its new flagship shavers, the Series 9 models. At the end of this article, we will show you how the Series 7 models compare with Braun’s latest products. All Braun Series 7 shavers feature superior power enhanced with sonic technology that gives their motor capability to perform 10,000 oscillations per minute. This enhanced power ensures that the shaver will capture every strand of hair on every inch of area it passes. The result is exceptionally clean and comfortable shave that users can enjoy. Neck area is often considered the most notorious problem when shaving not only because it is hard to reach, but also because hair growing on it is mostly flat-lying, which ordinary shavers often fail to cut. Braun Series 7 razors have exceptional capability to lift and cut such stubborn hair due to its Active Lift technology. Thanks to this technology, no area is considered hard to reach and no flat-lying hair will cause problem. Flanking the Active Lift comb are a pair of shaving foils with specifically designed holes that effectively capture hair and ensure clean shave. With this technology, more hair strands can be clean cut with fewer strokes. Shaving time will be significantly shorter and shaving experience will be more exciting. Different men have different level of skin sensitivity. All Braun Series 7 shavers are designed to accommodate such difference. Every Braun Series 7 model supports 3 shaving personalization options, including extra sensitive, normal and intensive options. Whether you want your shaver to play soft or hard with your skin, every Braun shaver in the Series 7 lineup can always provide you with personal satisfaction. All Braun razors in the Series 7 lineup are built with pivoting head and floating cutters that ensure super flexible shaving. The razor will adapt to the contour of the face excellently, allowing it to ensure clean shave on all areas on your skin without your having to go to the same spots over and over again. This flexibility means not only efficient, but also comfortable shaving and this design greatly reduces the possibility of irritation. All of those features are present in all Braun shavers of the Series 7 lineup, thereby guaranteeing the excellent quality of those shavers. Each model, however, sports specific features that make it stand out from the crowd. Basically, the higher the model number, the more advanced the features they offer. We can thus conclude that the 799 model, which is Braun’s flagship model, is the most advanced in terms of features. To give you clearer picture of what Braun’s Series 7 shavers can offer to you, here we present you the top four Braun Series 7 shavers that are currently available on the market and all superior features that they offer. At the beginning, when there were only four Series 7 models available, excluding the 740 s model, only the 799CC model supported wet and dry shave. The other models were usable only in dry scenario. 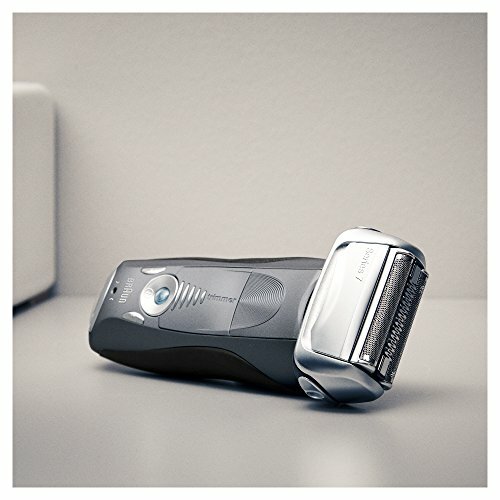 When the 740 model was released, Braun added another wet and dry shaver in its Series 7 collection. 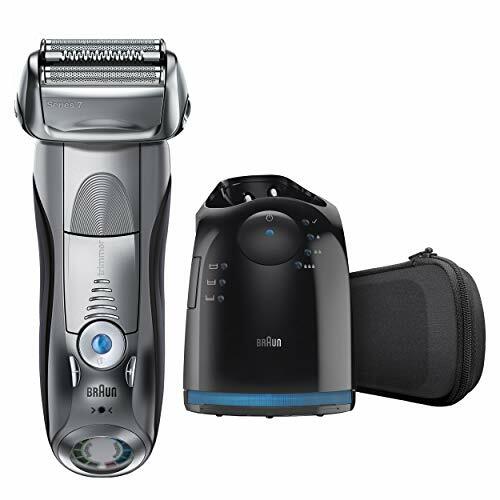 What is great about this shaver is that it is more than $100 cheaper than the 799 model. 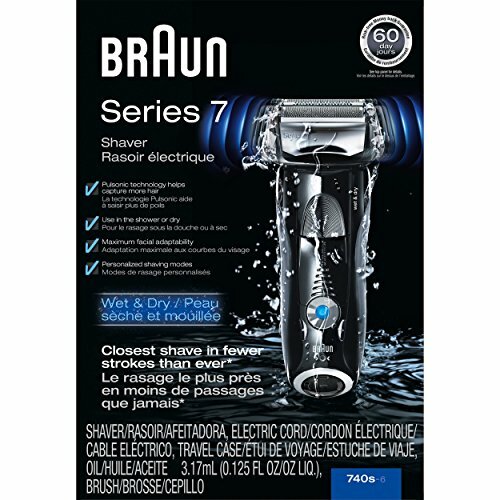 For customers wishing to have a fully washable wet and dry shaver without the expensive price of the 799 model, Braun Series 7 740 is a perfect choice. The 740 shares many features with the 799 model. The main difference between both model is indicated by the letter that follows the model number. The S in the 740S model name means that the shaver is sold Solo whereas the CC in the 799CC model name means it comes with Clean and Charge station. The absence of clean and charge station is the reason why the 740S model’s price is so inexpensive; however, customers who wish to enjoy the convenience of cleaning and charging their electric razor can buy the cleaning and charging station separately for $41.65. Given the fact is the model is fully washable and easy to clean, the price of a clean and charge station may not match the benefit that you will get from owning it. There is one small feature that makes Braun Series 7 740 better than the 799 model. Unlike the 799 model that features LCD screen, the 740 model already includes LED display, which shows brighter and more readable information especially when the shaver is soaked in water or covered with soap or when steam and mist is everywhere in your bathroom. 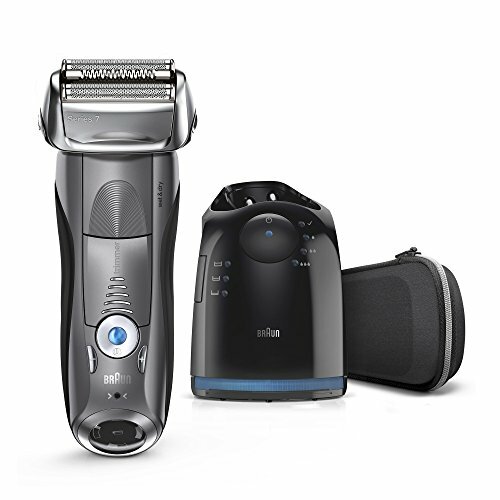 The Series 7 is the most advanced and premium shaver line from Braun. The Pulsonic technology with 10,000 micro vibrations helps capture more hair with every stroke – for Braun‘s most thorough and comfortable shave. 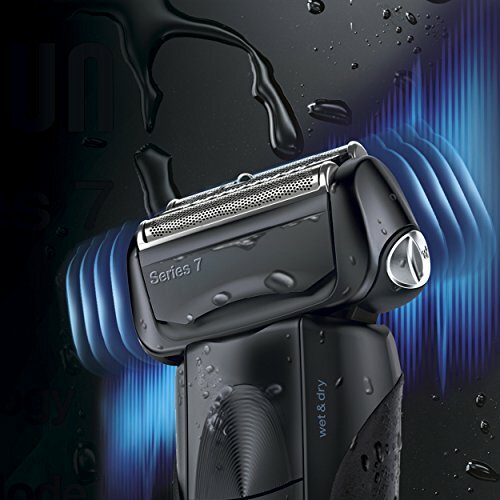 The Series 7 shaver combines the most advanced Technology and Design. Series 7‘s leading edge shaving technology three different Personalization Modes and a powerful Linear Motor. Braun shavers have a fully sealed body and can be rinsed quickly and easily under running water. 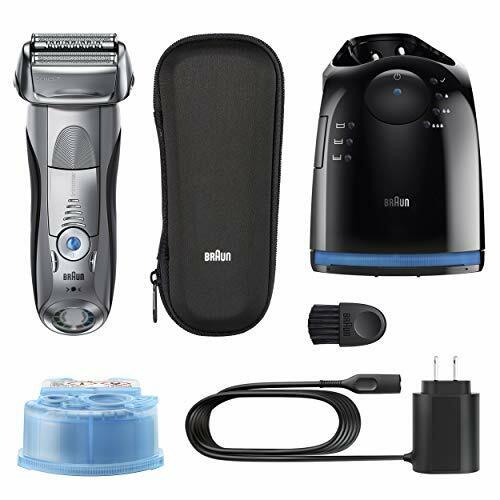 The 790 model is the most advanced in Braun’s Series 7 lineup and is designed to be a replacement (or an enhancement) for Braun Series 7 799CC shaver. The 790 model is more considered a replacement for the 799 model than an enhancement due to the very slight difference in features that is present between the two model. Both the 790 model and the 799 model has all Series 7 features that are mentioned above plus fast clean, automatic program selection and active drying features. What makes the 790 model different is its wet and dry feature. All Series 7 shavers released before 799 are usable only in dry scenario. The 790 is released specifically to add a wet and dry model to the series. You have to pay about $100 for that extra wet and dry benefit, so if you think that shaving under the shower is the most exciting shaving experience that you want to enjoy, you can go for it and choose the 799 model instead of the dry-only 790 model, but if you prefer a more cost-effective solution, one alternative solution is to buy a 790 model and Braun’s 340 wet and dry model, which costs only $49. Of course owning two separate shavers instead of only one carries its own hassles. Because this 799 model is a CC model, meaning it comes with its own clean and charge station, you need to purchase clean and charge cartridges separately. Luckily, if you buy this model, you will get two bonus cartridges for free, so you can wait for some time before you need to buy new cartridges. Be sure to keep the cartridges everlastingly sealed as the cleaning fluid will evaporate if the seal is broken, regardless of whether you use the cartridge or not. Before the release of the 799 model with its wet and dry feature, Braun Series 7 790CC is Braun’s most advanced Series 7 flagship shaver. 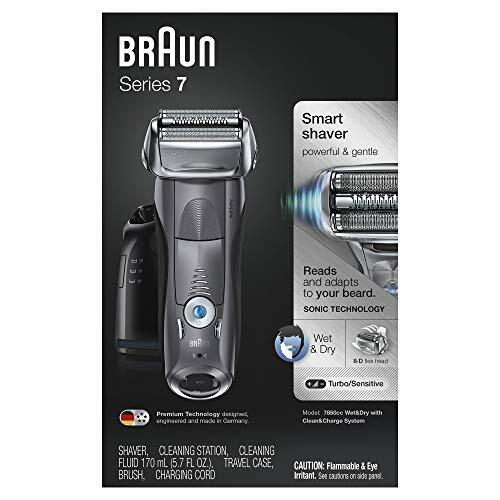 It has all features typical of all Braun Series 7 shavers, including sonic technology, active lift technology, opti foil technology, head’s flexibility, and 3 shaving modes. In addition to offering those features, it also offers active drying and automatic program selection features that are previously added to the 760 model plus fast clean feature that its predecessors lack. The 790 model is a dry-only shaver and its successor, the 799 model, is designed to fill that gap. There is a $100 difference in price between the 790 and 799 models, so if you think that wet and dry feature is an unnecessary luxury that you can cover more cheaply by purchasing a separate wet and dry shaver, the 790 model is your best option. Another good reason to buy the 790 model is because it is cheaper than the 760 model, which is quite a surprise considering the superior features that the 790 model introduces. The only drawback with the 790 model compared to the 760 model is that the former lacks LED display presents in the latter. The 790 model’s LCD display is obviously less clear than the 760 model’s LED, but this small difference is not a big deal, let alone a deal breaker. Finally, if you buy the 790 model, you get a premium leather pouch that gives you confidence when carrying your shaver in your trips. Its two predecessors, the 720 and 760 models, are bundled with a general pouch that barely looks fancy. This small bonus, though insignificant to your shaving performance and experience, is quite a perk especially if you want to house your premium shaver in a premium container. Braun Series 7 shavers are considered premium shavers, but you definitely don’t have to purchase it using premium price. Surprisingly, the same shaver model is sold with different price in the United States and in the United Kingdom. While the 790 model reviewed above is sold with £215.50 price tag in the United Kingdom, you can actually purchase it for only $148.00 in the United States. 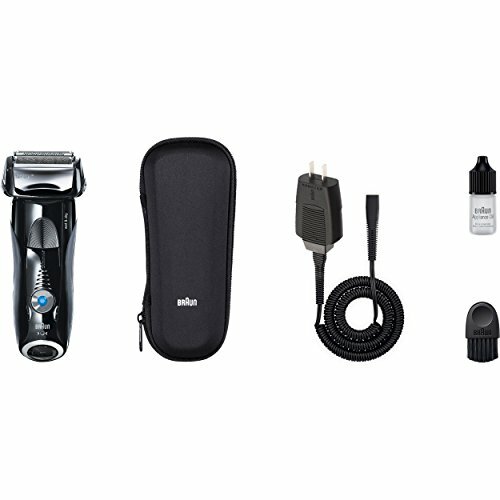 Should you consider price a major concern, you may want to have your purchased shaver shipped from abroad to get better deal. The Braun Series 7 is our smart electric shaver with 4 synchronized shaving elements that shave in one stroke what others do in two*. Innovative Sonic technology and an intelligent AutoSensing motor enable shaving even dense beards with efficiency. The five Turbo/Sensitive Modes adjust the shaver for extra power and gentleness at the push of a button. The best environmental temperature for charging is between 41 degree Fahrenheit to 95 degree Fahrenheit / 5 degree Celsius to 35 degree Celsius. Do not expose the shaver to temperatures higher than 122 degree Fahrenheit / 50 degree Celsius for extended periods of time. *Proven on a 3-day beard; IPI research institute, February 2015. 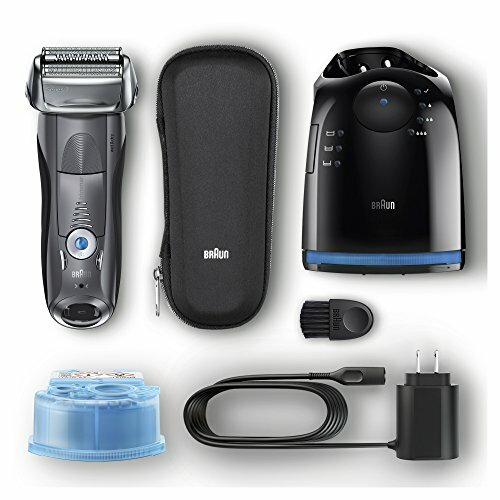 The Braun Series 7 is the ultimate electric shaver that reads and adapts to your beard, with built-in Responsive Intelligence for a close and gentle shave. A 100% waterproof electric razor designed to last up to seven years, it can be used to shave dry or with water, foam or gel. 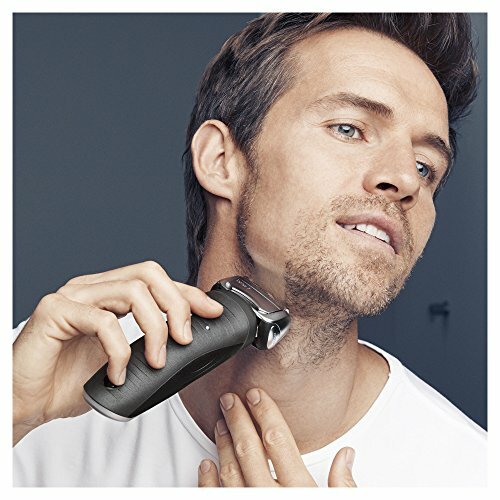 It features a skin-friendly precision trimmer to help you easily reach difficult areas, like under your nose or sideburns. Five personalization modes allow you to shave with the power that suits you and it works cordlessly for 50 mins on just an hour's charge. The world's only four-action alcohol-based Clean&Charge station selects cleaning function, cleans, lubricates and charges at the touch of a button - so your shaver feels like new every day. Premium Travel Case with brush included to take with you on the go. We have seen above some superior features that are offered by the best products in Braun’s Series 7 lineup. We have stated earlier that Braun has recently released its Series 9 models. There are many advancements that the new flagship models introduce, so you may want to take a look at features that they offer and how they compare with Braun Series 7 models. Here are some key elements that you need to look into when comparing Braun Series 7 shavers with Braun Series 9 shavers. Both Series 7 and Series 9 shavers use design philosophy that is based on such concepts are sleekness and flexibility. All of those shavers are designed to appear futuristic and to be flexible. Their feature pivoting head that ensures that no area around the face is hard to reach. Although the new model series features larger body, it doesn’t significantly affect the ergonomic factor of the shaver. 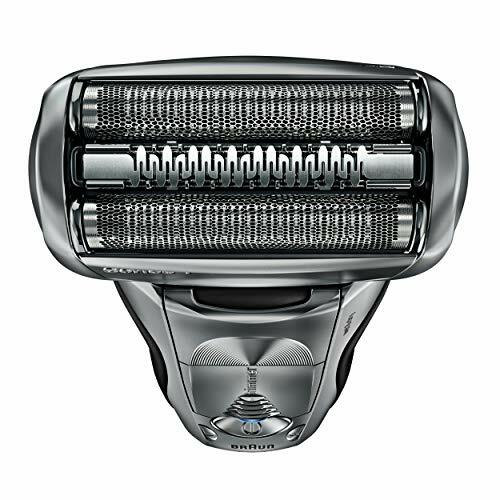 Both Series 7 and Series 9 are shaving machines that are comfortable to handle. Overall, in the design sector, Series 9 has both pros and cons. While Series 7 features full metal design, Series 9 features mostly plastic body with chrome finish and glossy surface. From aesthetic viewpoint, the design of the new series is considered more inferior. Besides, the chrome finish always appears dirty as it attracts smudges and the gloss seems to be prone to wearing away after being used for some time. Despite its aesthetic inferiority, the new series features many advancements that make them more superior in terms of flexibility and convenience of use. One of the biggest complaints concerning Series 7 is about the series’ awkwardly positioned trimmer. 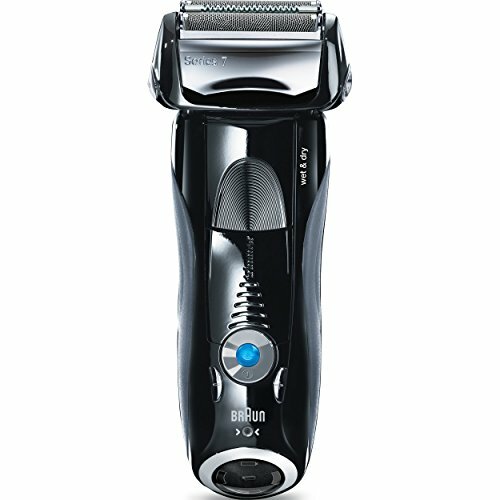 Braun corrects this by repositioning the trimmer in its Series 9 models to make it more manageable. 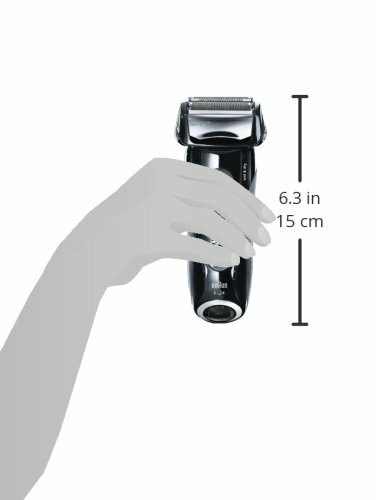 Series 9 also features shaving head that can rotate to any directions, which allows users to experiment with different head positions when shaving. One perk of using faster and more powerful motor is significantly improved comfort level. 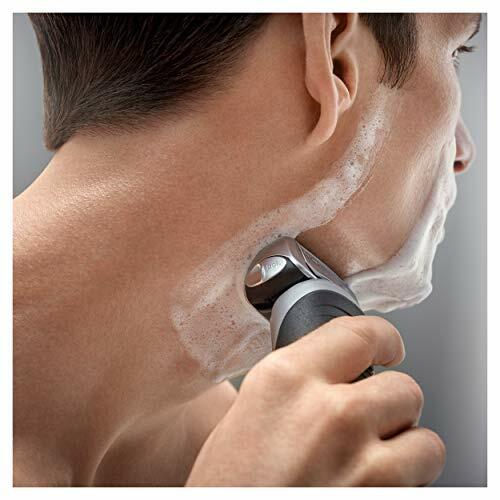 With faster blade movements, Series 9 guarantees smoother and more comfortable shaving experience. Pulling sensation is greatly reduced and the shaver will slide smoothly on the skin as if it doesn’t cut anything. Just like Series 7 that feels comfortable even when used on sensitive skin, Series 9 also features flexible modes that allow it to remain comfortable when used both in soft and hard scenarios. For a premium shaver that you will invest in, use for a long period of time, and enhance with replaceable components, cost-effectiveness becomes an important factor. In cost sector, we can confidently say that Series 7 wins in every regard. The price of Series 7 shavers at the time of their release is significantly lower than that of Series 9 shavers. Now, as Braun introduces the new series, the price of Series 7 shavers must have dropped, giving you better reason to buy it. In terms of the price of replaceable components, Series 7 is also a more appealing choice if compared with Braun’s latest shaver series. Here we want to focus on the shaver’s head, which customers most frequently replace. Although the replacement head of Series 7 is priced higher now than it was when the series had just been released, the price is still noticeably cheaper than the price of Series 9’s cassettes. There are many advancements that Series 9 introduces, but there are obviously many reasons why purchasing Series 7 shavers is still a good decision. In brief, here are reasons of buying either series of Braun shavers. 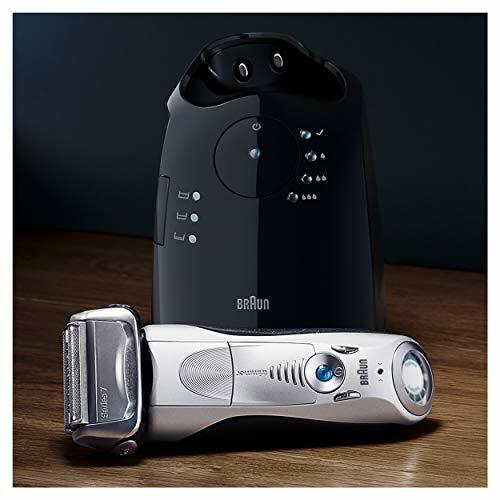 You can decide on your own whether to switch to Braun’s newest series or whether the old flagship shaver is still the best for you. There are four Braun Series 7 models that are available in the market, including the 720, 760, 790, and 799 models. Later, Braun added one new model, the 740 model to the rooster. Basically, you may not want to buy the 720 model as it lacks many features that its successors have but it is not significantly cheaper than the latter. You may also not want to buy the 760 model because although it is more advanced than the 720 model by introducing three new features, namely the automatic program selection, clean and charge station, and active drying features, it is about $15 more expensive than its successor, the 790 model, which offers all features that it has plus fast cleaning feature and premium pouch. In the end, your only choices include the 790 model, the 799 model that adds wet and dry feature, and the 740 model that also offers wet and dry feature but is sold with significantly cheaper price. All of those three models are already reviewed here and they are still considered perfect choices even after Braun releases its newest Series 9 shavers.